Preserving natural tree canopy and the prudent use of tree plantings in urban landscapes contributes to the control of runoff through a number of mechanisms. trees, associated ground litter, and groundcover provide filtration and vegetative uptake of contaminants, enhancing water quality. These functions for control of runoff and its impacts are further discussed below. Through the processes of interception, evaporation, and transpiration, trees and other vegetation capture and store a portion of rainfall and release water to the atmosphere, reducing the net amount of rainfall that becomes runoff. Rain is captured (intercepted) on a plant’s leaves and stems (for trees, the leaf and stem complex is referred to as "canopy"). A portion of this captured water evaporates back into the atmosphere before reaching the ground. Larger canopies intercept greater amounts of precipitation because there is more surface area available for water molecules to adhere to. Some water flows down the plant stem to the ground as "stemflow", and some rainfall infiltrates the ground around the plant, entering the root zone where the plant withdraws moisture to sustain itself. In this process, water taken up through its roots is then released through the plant's vegetative structures as water vapor, a process known as transpiration. The combination of these two mechanisms - evaporation and transpiration - whereby a plant transfers moisture to the atmosphere is referred to as evapotranspiration. In both processes the water is diverted before ever becoming runoff. Mature tree canopies are of particular value in the interception of rainfall. For example, in a New Hampshire hardwood forest at the Hubbard Brook LTER site, deciduous trees were observed to intercept 13% of the total rainfall during the leaf period and 12% of the total rainfall during the leafless period (Leonard, 1961). Individual mature trees also provide significant rainfall interception. An illustration of this potential stormwater benefit using the National Tree Benefit Calculator was cited in Chapter 1 of this report (i.e., greater than 9% annual rainfall capture over the "footprint" of the tree). The significant volumes of interception shown in that example and in the Hubbard Brook study cited above are consistent with findings of other studies throughout the United States. The amount of rainfall intercepted by vegetation varies depending on the type of species, time of year, and intensity and duration of the rainfall event. Species characteristics like leaf surface area and specific tree architecture contribute to the variation in total water intercepted. Also, trees typically intercept more rain during a storm of longer duration than a short storm with equal total rainfall accumulation (CUFR, 2002). In areas where rainfall is highest in the fall, winter, and spring, broadleaf evergreens and conifers intercept more rainfall than deciduous species (Xiao and McPherson 2002). Another crucial role plants have in reducing landscape runoff is facilitating ground water infiltration. Plants provide suitable conditions for water to infiltrate through several mechanisms. Decomposing plant material on the ground captures and temporarily stores runoff. Root systems create large pores in the soil called macropores that facilitate infiltration. Tree roots provide pathways for stormwater infiltration to enter soils compacted by development activity (e.g., see Bartens, et.al., 2008). The uptake of water from the soil by plants between rainfall events frees pore space that then becomes available for storage during a subsequent storm. Note, however, that in the case of trees, much of the infiltrated water will ultimately be taken up by the trees themselves, so that in areas with extensive tree cover, deep groundwater recharge may actually be less than in areas with little or no tree cover. Vegetation not only reduces the volume of runoff, but can also reduce runoff velocity compared to flow over an un-vegetated surface (an effect referred to as vegetative retardance). This results in longer times of concentration. Natural surface roughness associated with vegetation contributes to lower peak rates of discharge than would occur on an un-vegetated landscape. Maintaining and restoring vegetated landscapes thus can contribute to the control of the rate runoff is transported through a drainage basin. Trees and other vegetation throughout the landscape stabilize slopes and channels and prevent soil erosion. 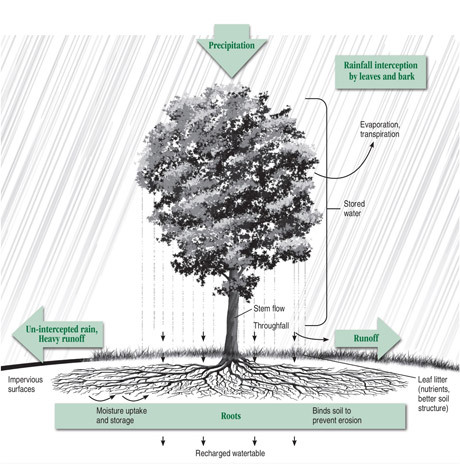 Trees protect soil from direct exposure to falling rain by intercepting rain, absorbing the impact of rainfall that does drip from the leaf surface to the ground, and providing leaf litter that absorbs the impact of rainfall as it hits the ground. Each of these mechanisms helps prevent dislodgement of soil particles by rainfall. Additionally, the tree's root system keeps soils intact, stabilizing slopes against displacement by runoff flowing over and through the surface soils. Reduced erosion rates from vegetated landscapes protect the quality of receiving waters by minimizing transport of sediments and associated pollutants. Not only can trees reduce the total amount and rate of stormwater runoff, they can also improve the water quality of runoff. The forest litter associated with woody plants (as well as groundcovers that may thrive beneath trees) can filter runoff as it passes over the ground. Woody plants in particular can uptake nutrients, contaminants, and metals from water or soil. A study showed that within one growing season a maple removed 60 mg of cadmium, 140 mg of chromium, 820 mg of nickel, and 5200 mg of lead (Coder, 1996). Vegetative pollutant uptake improves the surrounding soil and water quality, resulting in less contamination in runoff reaching the stormwater system from tree covered landscapes and from stormwater treatment practices that include tree plantings. An additional water quality benefit provided by tree canopy comprises moderation of the thermal impacts of stormwater runoff. For discharges to temperature-sensitive water resources such as coldwater fisheries, prudent preservation or enhancement of tree cover to shade impervious surfaces (where runoff originates), outlet channels (where runoff discharges), and stream banks can moderate temperatures of stormwater discharges.